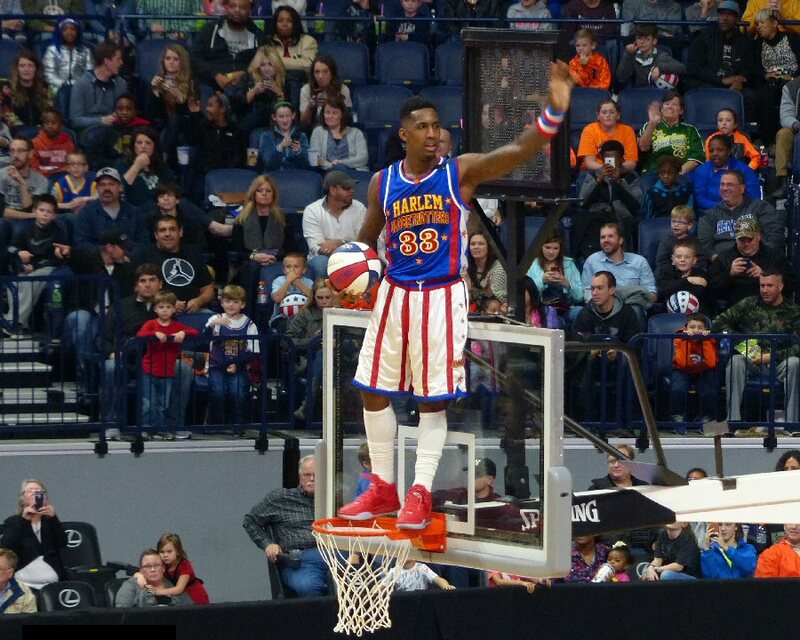 The Harlem Globetrotters brought a lot of laughs and smiles to the Bridgestone Arena in Nashville, Tennessee on Friday, January 15, 2016. The team is also celebrating 90 years of ball handling wizardry. 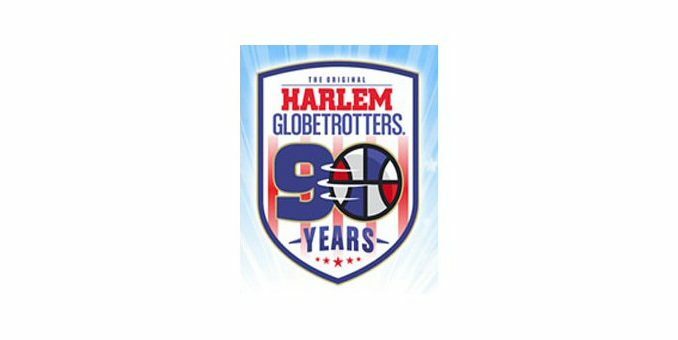 This season is being dedicated to Meadowlark Lemon and Marques Haynes two Globetrotter legends who passed away in 2015. Clips of both were shown on the big screens over center court before the game. 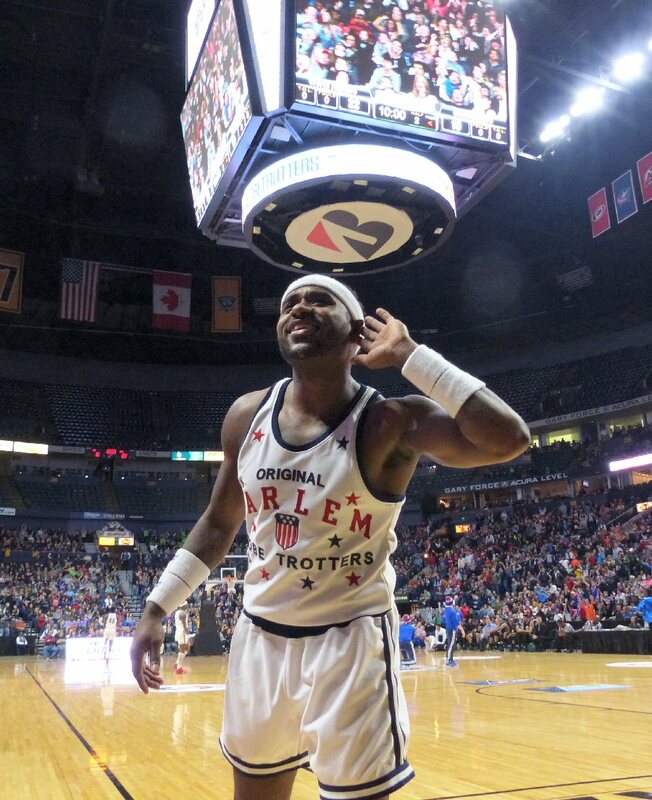 The Harlem Globetrotters celebrated their 90th season in a big way in Nashville. Prior to the main event, Globie and the team’s MC entertained families with dancing, interactive activities and musical chairs where dare we say that Globie might have cheated in a comical way. Despite that a little girl prevailed at musical chairs to walk away with a prize. The opposing team the World Allstars were introduced first. Their manager was talking tough declaring that they were going to beat the Globetrotters. Next, the home team in red, white and blue made a dramatic entrance with smoke and strobe lights. In honor of their 90th Anniversary the squad was wearing classic “throwback” uniforms. As the Globetrotters’ signature song “Sweet Georgia Brown” filled the Arena both sides warmed up with ball spinning, dancing, hoops and innovative passing. Bull with the DUNK at the Bridgestone Arena. After a few more antics the game began with Stretch who is a little over 7 feet easily scoring 2 points. The contest continued with agile play mixed in with more fun including a tee-shirt toss. Big G another team mascot did some impressive dancing on his head. The Allstars’ manager continued trash talking. Ant the Showman was often instigating comical incidents that interrupted the game. Ant was all over the place being antagonistic, interacting with fans or arguing with the referees. On a more serious note Thunder took a moment to tell the audience about World Vision one of a number of non-profits that the Globetrotters support. World Vision had tables set up at the Bridgestone Arena to share their mission. The Globetrotters are also Ambassadors of Goodwill supporting other organizations along with their own “The Great Assist” outreach programs. Team members work in communities to prevent bullying, promote fitness, build homes and more. 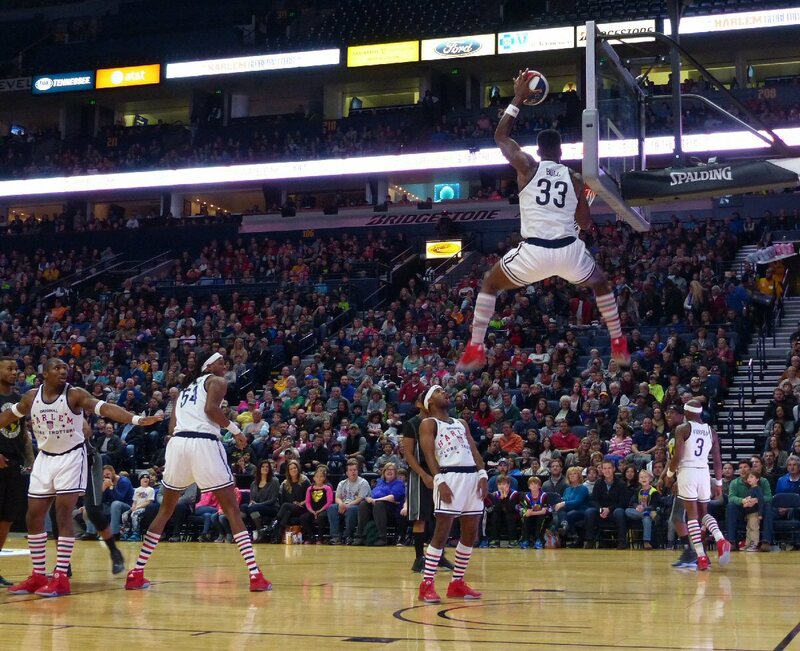 The Harlem Globetrotters are still on top of the basketball world in 2016. In 1985, Lynette Woodard made headlines for becoming the first female player with the Harlem Globetrotters. Now, there is a woman on the floor at every performance which is another way in which the Globetrotters have demonstrated innovation in the sport of basketball. The Globetrotters also hold records for longest and unique hoop shots. A local cheerleading squad was part of the half time entertainment. The second part of the game got more complicated as the Allstars’ manger kept pulling out a “rule book” to get Globetrotter players expelled from the game. The Globetrotter almost had to forfeit the match as they did not have enough players on the floor at one point. 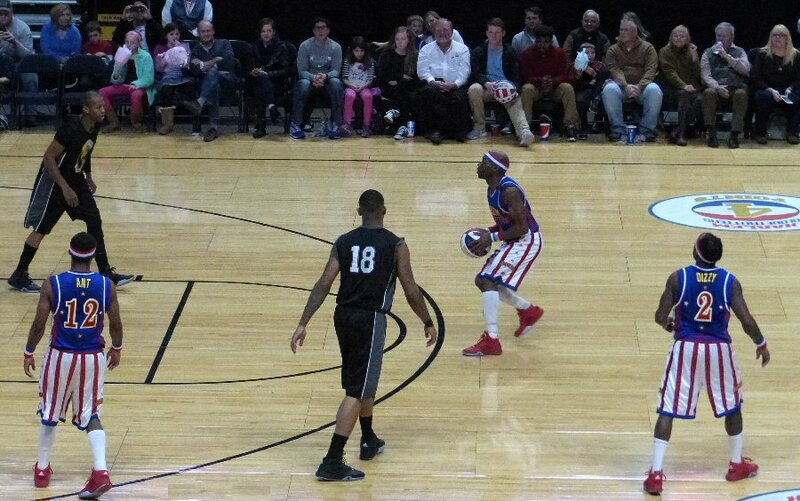 The competition continued with more comedy and skilled scoring until the Globetrotters won 83-79. After the game the team was available to sign autographs. 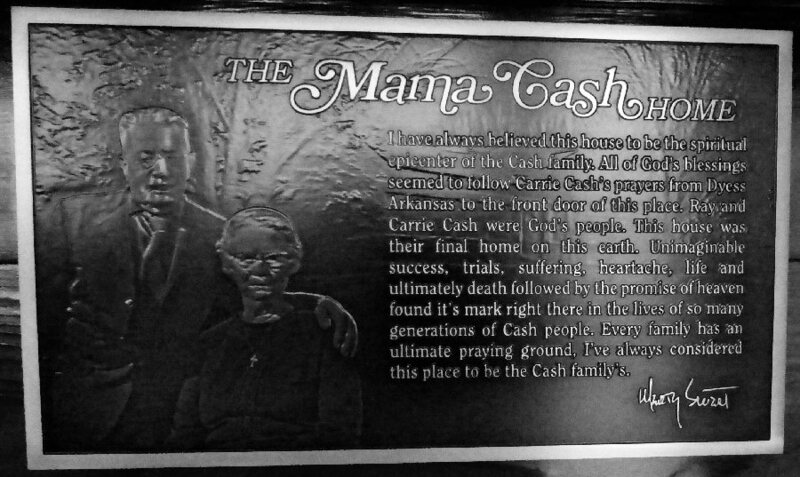 The crowd roared early and often in Music City. The goal at each Globetrotter game is to bring smiles and the skilled squad in Nashville achieved that aim with an engaging event. The Globetrotters have been featured in films and on TV shows. The team was awarded a star on the Hollywood Walk of Fame in honor of their entertainment value and the Globetrotters were inducted into the Basketball Hall of Fame in 2002. So come celebrate 90 years of entertainment and expertise when the Globetrotters come to your town. The Bridgestone Arena has both traditional concessions along with BBQ and local vendors. The Arena in the heart of Downtown Nashville is home tuff for the Predators hockey team. The Bridgestone hosts a wide range of music and sporting events such as the Harlem Globetrotters. 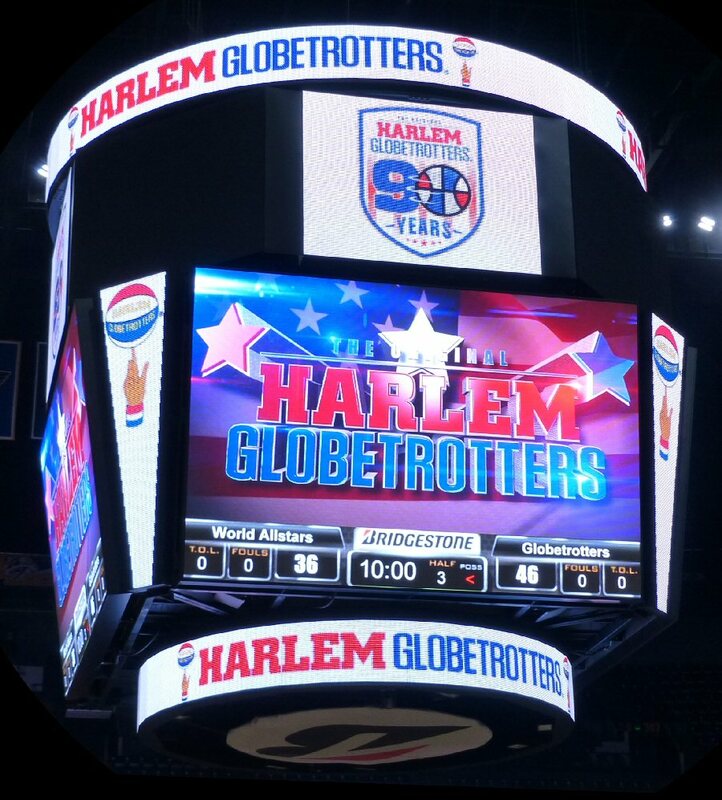 The Globetrotters got to work on the floor to manufacture a thrilling comeback.